Lernfreude: It’s a German word referring to the “love of learning” that captures University of Georgia Stamps Scholar Kavi Pandian’s dedication to improving the American education system. At the University of Georgia, he studies sociology and economics and is in the Honors program. His freshman year, he became involved with the organization RefUGA, which is focused on refugee advocacy and education efforts. He served as the vice president of education and put together educational materials, presentations, and simulations of the refugee process. As part of the Foundation Fellows Program, he went to the University of Oxford after his freshman year, where he learned about English Common Law. He spent the rest of the summer backpacking around Europe with fellow scholars. He also completed two internships, one with the JW Fanning Institute for Leadership Development, which works to build capacity among local leaders. As part of this internship, he worked with Athens’s Peer Court, a diversionary program for youth who committed crimes. 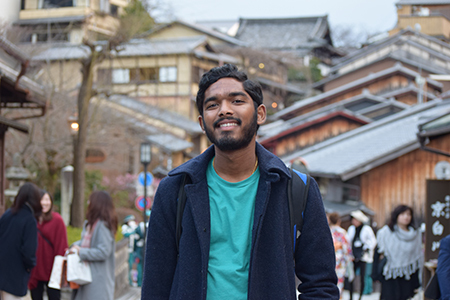 As a student intern, Pandian helped craft opening and closing statements and discussed what restorative justice was and the role that played in students’ recommended dispositions. This past summer, he was part of the Honors in Washington summer internship, which is through UGA’s Honors Program. He interned at the District of Columbia Public Schools’ (DCPS) Office of Instructional Practice. He was part of the Urban Education Leaders Internship Program working on the LEAP Team, a new professional development initiative that includes summer intensive institutes for teachers and school administrators. “It’s not just about managing a classroom, but knowing the material really well and building up capacities at schools to support the teachers themselves and finding ways to teach that are most culturally responsive and aware of the unique context of school.” Pandian also helped with the innovation team that is pioneering the use of video for teacher observations and feedback. Currently, he is working with the Carl Vinson Institute of Government’s International Center on a personal research project involving the children of Korean diplomats and other expatriates living in the United States. He is interviewing the youth and their families about their experiences transitioning to the American education system. He is hopeful that this knowledge can be used for training sessions for future Korean families coming to the U.S.